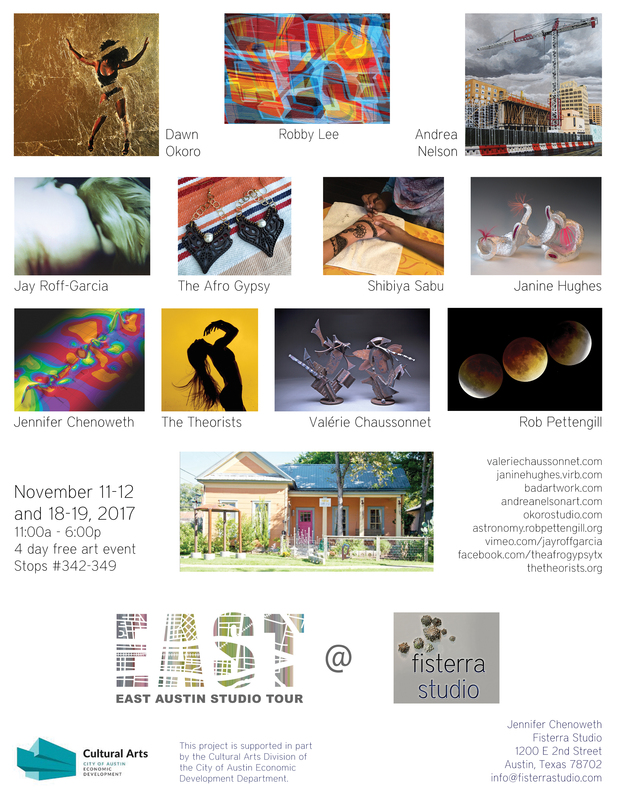 Visit www.eastaustinstudiotour.com for information about other studios on the tour. Tour catalogs can be picked up at City of Austin Libraries starting October 30, 2017. Free with registration – Register Now! A collaborative project between the Design Institute for Health, Fisterra Studio, the Thinkery, ThinkEAST, and Johnson & Johnson – to develop new approaches to improving health in a community. This project uses a creative process to combine visual arts, learning and exhibit design, and new approaches to data visualization to create new health capabilities in a planned community for East Austin. This studio tour will feature proposed solutions to change the context in which people engage with their health – to raise their health consciousness and literacy, to empower and enable them to act on their own behalf, to develop new insights into the priorities and behaviors of community members, and ultimately to create offerings that have significant impact on their collective health. More info about other stops at East Austin Studio Tour. 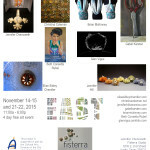 PRESS about FISTERRA for EAST 2016, THANK YOU!! And last year, Edible Austin’s writer Anne Marie Hampshire wrote a great piece about the Green Chile Posole that I will be cooking for you each day of the event. Edible Austin’s writer Anne Marie Hampshire wrote a great piece about the Green Chile Posole that I will be cooking for you each day of the event. Austin artist Jennifer Chenoweth will present new work from the XYZ Atlas: the Hedonic Map of Austin, a public art project that connects feelings and places. On the first weekend of WEST (May 9-10), people are invited to flag a large-scale map of Austin with their meaningful experiences. There will be a crafts table for kids to make emotion flowers for their Moms. There will be some food truck vendors on site too. On the second weekend (May 16-17), a large outdoor sculpture,”Dance of the Cosmos”, will debut at the Ney Day Celebration and continue on exhibition until Spring 2016. A large-scale, solar powered mechanical lotus bloom that is in sync with the sun. 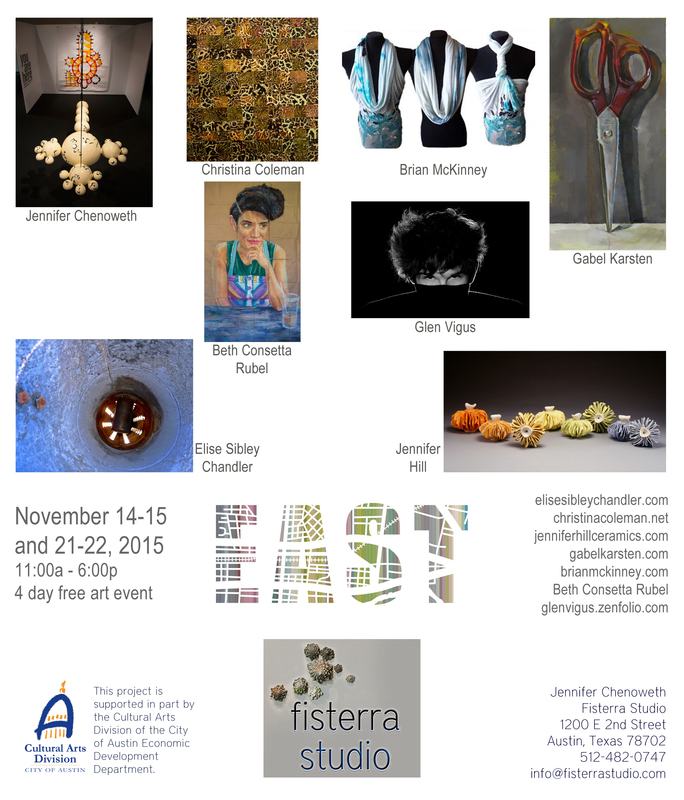 Fisterra Studio is pleased to announce a solo show of drawings, paintings and sculpture hosted by the Wright Gallery in the Department of Architecture at the Texas A&M University in February 2015. Artist Jennifer Chenoweth’s paintings and drawings use architecture and geometry as a starting point of finding yourself in space. She examines paths, plans, elevations, shapes, and scale that describe our environment. We have visceral responses to where we find ourselves in a place. Some architecture was built to shelter us, to embrace us, or to dwarf us. How do we understand the elements of those designs? How do we compose ourselves within those shapes and spaces? What makes us feel included and connected? How does the scale of our bodies affect our perception of a place? Austin visual artist Jennifer Chenoweth hosts her annual Austin party at her home and art studio during the 2014 EAST Austin Studio Tour. Enjoy refreshments and taste Jennifer’s homemade posole as you see her artwork in the context of where she makes the art. 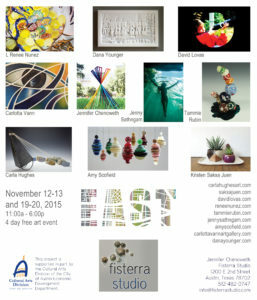 Fisterra Studio’s event is unique every year in that a new group of guest artists will be present and their work on display. The theme for the art and artists this year is “Intimacy.” Any open house tour is fascinating for voyeurs who like to see how others live. This year at least three of the artists will be doing intimate interactive projects with and for visitors, the other artists’ subject matter is intimacy. Katelena offers one-on-one comfort-fetish rituals in an emotional day spa, Comfort Station. Jennifer will be producing drawings indexing the body space of visitors. Lisa will have an installation in the master bedroom about the minutiae of relationships. Wells’ work is about the private mirrored space between two planes. Jason’s work is an intimate study of the objects in our lives that we collect and discard. Aaron’s film documents the fragility of bodies in conversation with a mortician. Lauren’s installation in the bathroom will surprise. Calder’s interactive art projects examines our relationship with nature and the ways humans impact biodiversity. Their collective body of work ranges from 2D, 3D, film/video, installation and performance. Check out their individual websites listed above. Thank you Austin Way for the great article! Thank you Austin Convention and Visitor’s Bureau for inviting the world! Thank you Downtown Austin Alliance! Thank you so much Jeanne Claire van Ryzin! On view and ready for your input: The Hedonic Map of Austin is currently installed in the lobby, stairwell, and 5th floor conference room at The University of Texas at Austin Department of Psychology. The SEA building is on the northwest corner of Speedway and Dean Keeton Avenue on the UT campus. You can see the history of the project, the arial photograph of Austin, the October 2013 results of the survey, paper forms of the survey to fill out, and diagrams of Plutchik’s chart of emotions with artistic interpretations and narrative answers to the 20 questions on the public survey. We are really excited that the Department of Psychology wanted to host and collaborate on this Hedonic Map. Show is funded and supported in part by the City of Austin through the Cultural Arts Division believing an investment in the Arts is an investment in Austin’s future. Visit Austin at NowPlayingAustin.com. Art-making is my primary spiritual action. Creating art allows me to express my unique manifestation as a body and as a conscious being. The series Sacred Spaces explores the interactive space of the human body through architectural sculpture and gestural mark-making. Historically, painting told the stories of a culture on the surfaces of sacred spaces such as caves, temples and churches. What remains unique to visual art is the hand of the artist and the visceral relationship of the art object to both the maker and viewer of the art. In the exhibition”Sacred Space”, the human body is represented in its indexical evidence in drawings and in geometric markers of ourselves. I create forms that unify these ideas and the finished artworks are both sculpture and painting. Works in the show invite the expanded selves, our compact selves, and record playfulness within a circles scaled to fit our expressions of who we are and what we are capable of. Sacred Space was on view at the Julia C. Butridge Gallery at the Dougherty Art Center, Wednesday June 5 – Saturday June 29, 2013. The show was funded and supported in part by the City of Austin through the Cultural Arts Division believing an investment in the Arts is an investment in Austin’s future. Visit Austin at NowPlayingAustin.com. 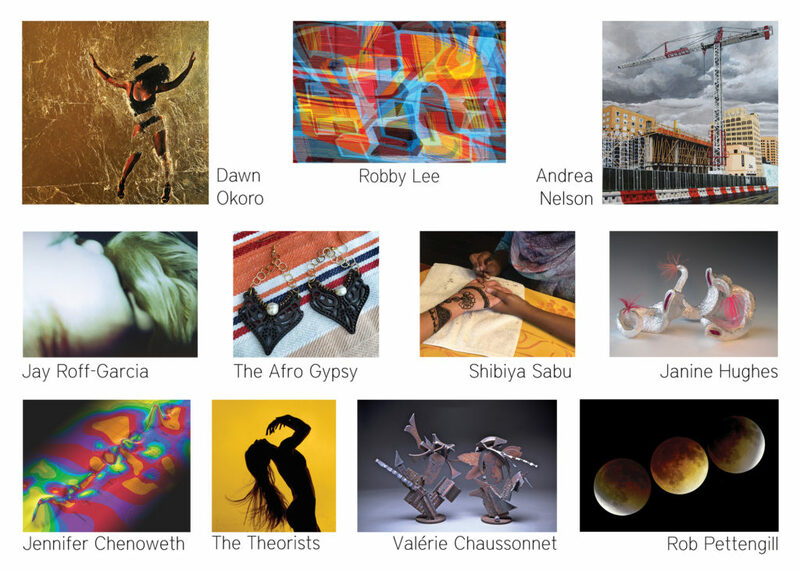 There was an art party/reception June 11, and an artist’s talk June 27. Jeanne Claire Van Ryzin of the Austin American-Statesman wrote a feature article for the Life & Arts Section about the show that ran on June 20, 2013. Mike Lee of KUT’s Arts Eclectic interviewed Jennifer about the show and you can hear the interview here.